First set of contacts and I am very satisfied. Comfortable in and brilliant color. Took 18 days to ship. Vibrant red, very comfortable, and beautiful. I bought this contact purely for the purpose of cosplaying. I ordered it with prescription and I must say, I love this contact. It does enlarge your eyes a little bit, but it was so smooth to put on. And once it's in there, you'd barely notice it's there. As a regular contact wearer, I couldn't be more happy. 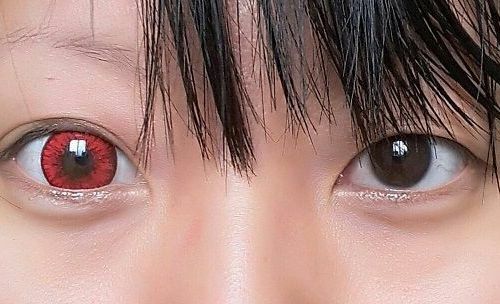 In fact I wore this contact for 2 days, 12+ hours each day, at an anime convention, and not once did I have to re-wet my eyes. 55% water content is a joy to wear. Worked perfectly for my kazuichi (on the right) cosplay. Slow shipping but the packaging was clean and cute. They feel gentle on the eyes as long as washed properly of course.